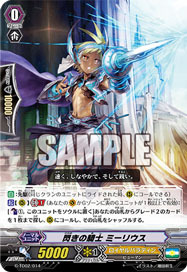 [A] [(R)]: [Counterblast: (1), Retire this] When this hits a Vanguard with an attack, if you have a ::Granblue:: Vanguard, you may pay cost. If so, choose a ::Granblue:: in your Drop Zone that isn't "Death Seeker, Thanatos" and Call it to (R). The grim reaper is fair to all no matter whether you are wealthy, evil, lovers, or hero.